For the last few years I’ve been growing sweet potatoes in various places. 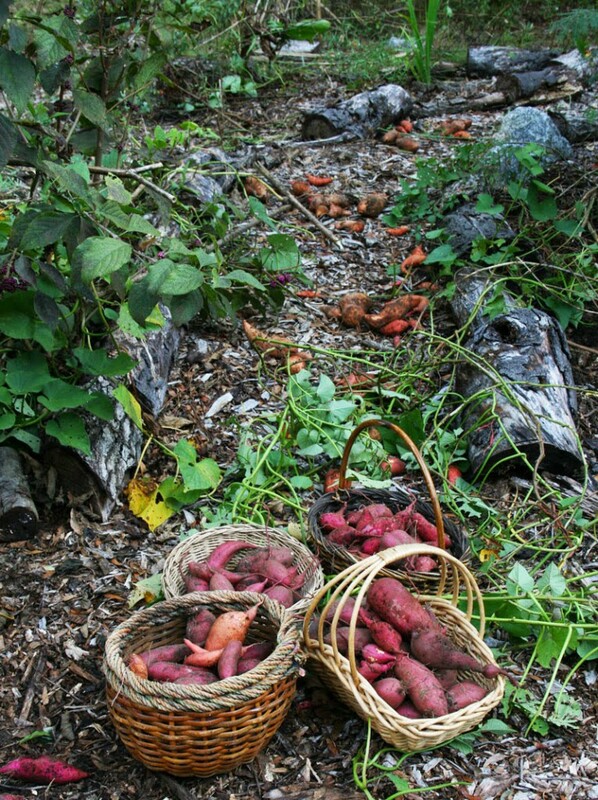 In Florida sweet potatoes are one of the easiest crops you can grow. 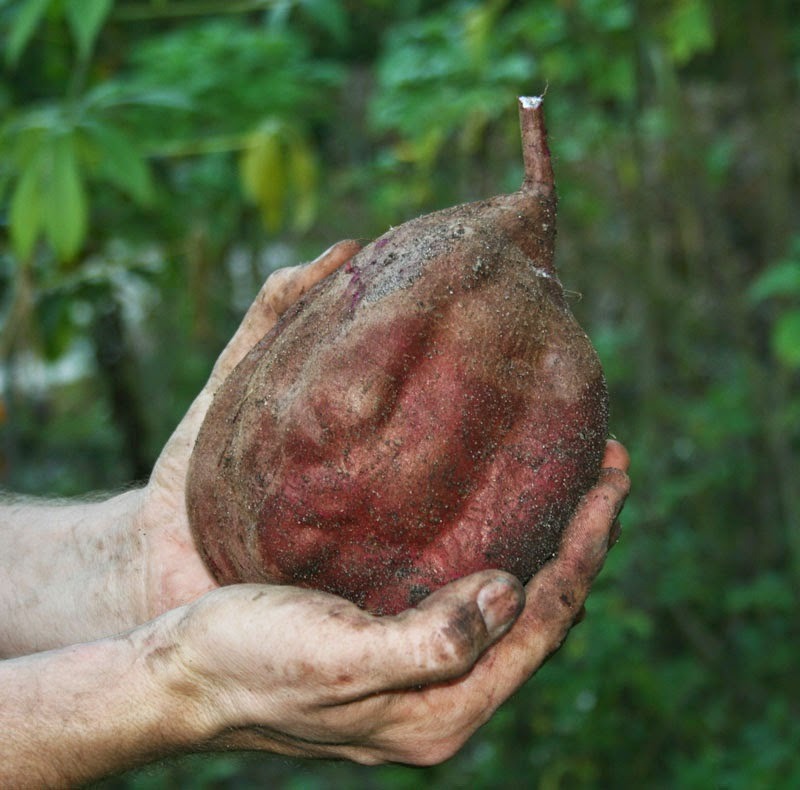 Healthy, nutritious, low water needs, plus high in calories – you can live on these roots. 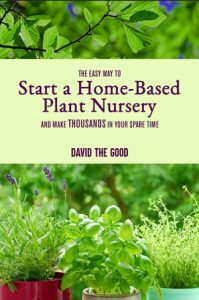 Bonus: you don’t have to grow them in a conventional garden. The first way I grew them as a kid, long, long ago, was in my neighbor’s flower box when she was out of town. They took over and smothered the petunias. Later, I’ve grown them here and there in raised beds and in deep mulch gardens and even in my blueberry patch. I don’t recommend doing that anymore, since my blueberries grew really slowly thanks to the root competition. I also tried growing them around cassava but the canopy overhead was too much for them – if I do that again, it will be with widely spaced cassava plants. Now I’m sold on a better way to grow them: right in the food forest. I’ve done that for a few years. It was a nice ground cover; however, the yields were poor due to the lousy compacted sand they were growing in. After dumping a few loads of mulch last fall, however, along with doing a lot of chop and drop (and shredding stuff), everything is starting to look really, really good. And the sweet potatoes know the soil has improved. I went out on Sunday afternoon and started rooting around. AH! Here’s the mother lode!!! Rachel The Good is my photographer. And lover. Shh. 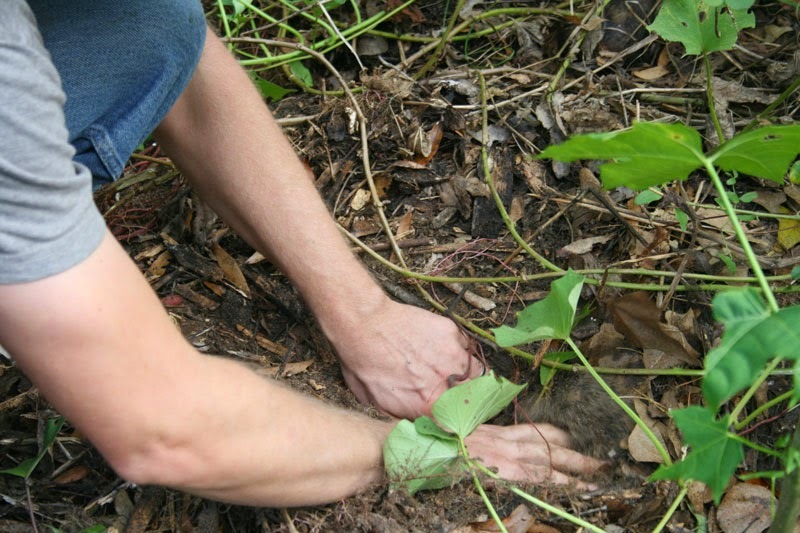 Overall, I planted perhaps 20 slips in the spring… and just let them run through the food forest around my trees and shrubs. Some made plenty of roots… some didn’t. Not bad at all considering I didn’t water or fertilize or do anything from March all the way through November. I just let them ramble and occasionally pulled vines out of the paths. Check out my foxy new glasses. And my giant sweet potatoes. Which are more awesome? Hard to say. 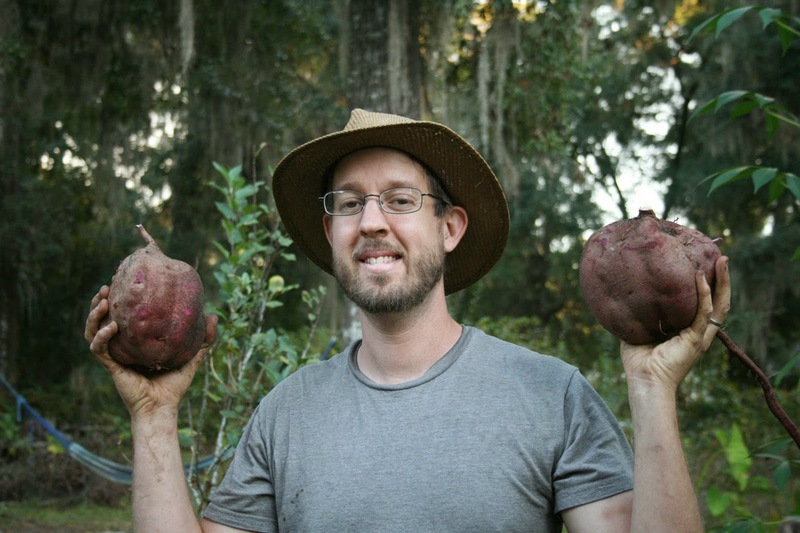 The biggest sweet potato tipped the scales at 3lbs, 12 oz. I really pulled in a decent yield considering the lack of work involved. Just some cuttings in spring, some deep mulch, whatever rain the Lord sent and then a little digging. Fortunately, I received a lot of help from our two-year-old. That boy is great at filling baskets. Babies and sweet potato harvesting = a great afternoon. By the way, we buy our baskets from local thrift stores for a dollar or two each. They’re great help on the homestead and much cheaper than buying new baskets or totes. Plus they’re all different and homey. 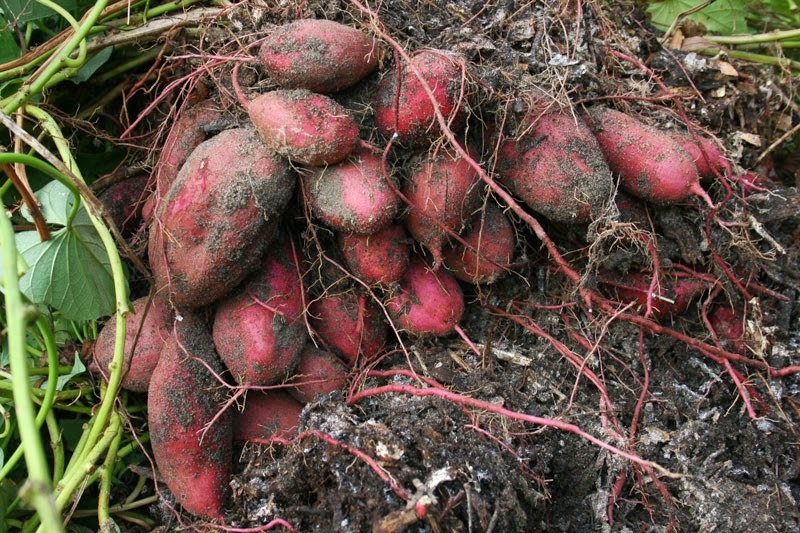 If you haven’t planted sweet potatoes in your food forest or mulch beds, why not try some in the spring? They’re a wonderful crop and very rewarding. Pulling them up is like digging for treasure. 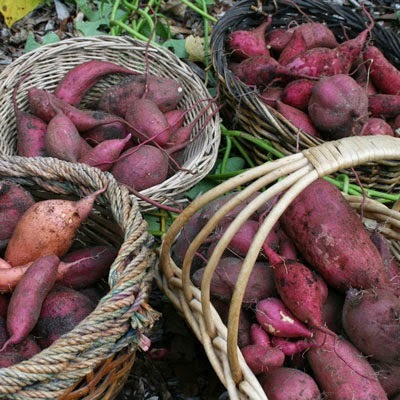 Growing sweet potatoes is SO simple you’ll wonder why you’d never done it before. 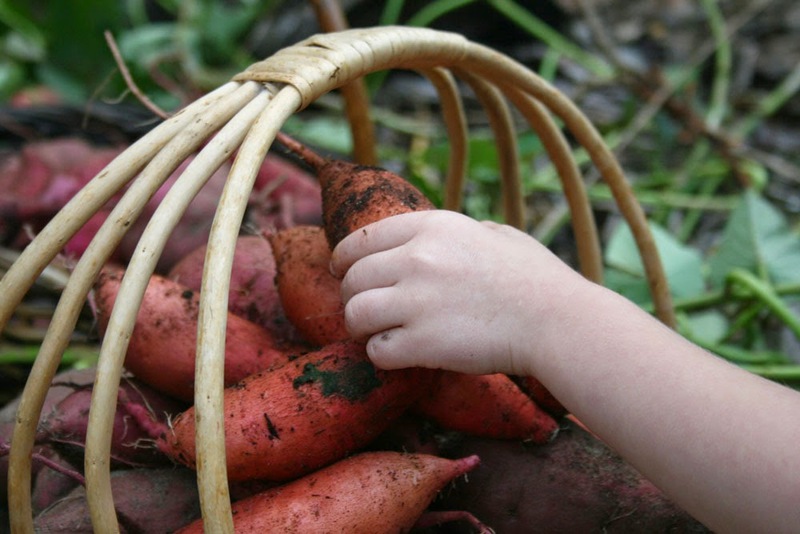 The best part about growing sweet potatoes every year and harvesting bushels? We’ll be enjoying these well into the winter… and when they’re done, it’ll be time to plant again. good looking Sweet taters David,i'm hoping for a few myself but i planted very late.I bought some sweet taters from Tim sometime over the summer, cut the ends off them, and stuck them in the ground all around. when they came up and got a few inches long i cut some of the runners and stuck them around also. they're all growing vines. the potatoes we will have to wait and see 🙂 as you say they are very easy to grow though . That's a great way to plant them. In south FL you can basically pull and plant vines year-round. Hope you get some. If not this year, next. That is awesome! My now 3 year old also loves to fill the baskets. :) I tried to plant sweet potatoes once a few years (and two houses) ago. I got lots of vines and zero potatoes. Then I thought to myself, "Phyllis, where did you get the potatoes that you made slips from? Ah- the supermarket!" Wah-Wah-Wah! Heh. I've actually had great luck with supermarket sweet potatoes – my bet is that they didn't set roots because they were either a: too happy or b: sad. 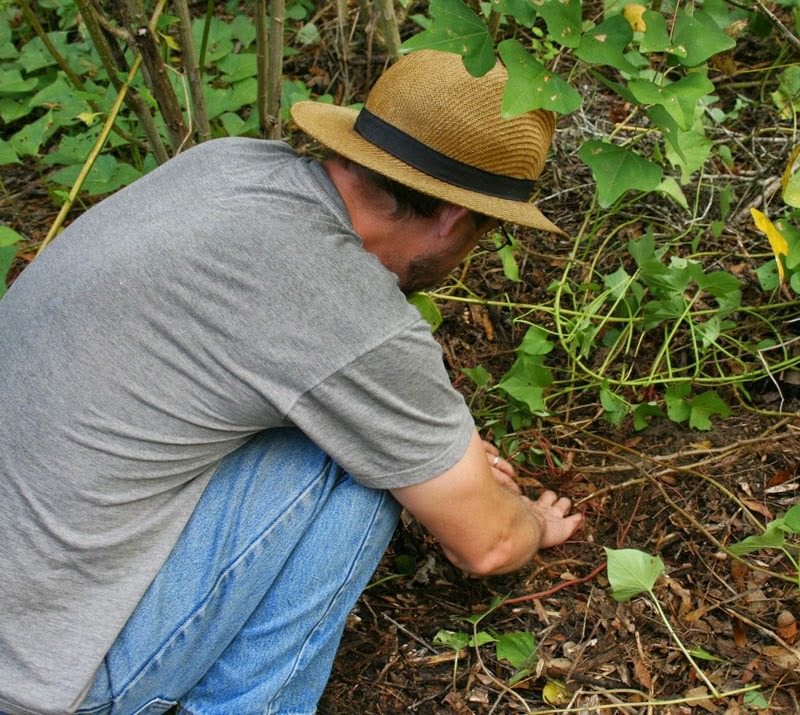 phyllis, nitrogen fertilizer will give you lots of vines and few or no roots. a little is o.k. to get started, but cut back once the vines start growing. conventional ferts, manure, bloodmeal, any source of nitrogen, a very light touch to begin, then nada. One of the few things I can grow in my over shadowy yard. I need to dig up my small haul this weekend as the vines have withered. But it has rained off & on over the past couple of weeks. I'll get no where near 70 lbs but for the few we eat, but it will be worth it, free! Oh yes. Free is the best. Wish it were already next year. Have some slips growing in a bowl with water. May try to transfer to a deep container inside to keep growing till it warms up next year. Good idea. Keep them in a sunny spot. We got four little sweet potatoes from two plants, but it was weird, some of the roots were up to 1/2" thick and pretty long, like they wanted to get bigger but didn't. The plants were from a sweet potato from the store that sprouted on our counter, but we live in MI, so we can't get them in the ground very early. So when you harvest them, how do you prepare them for storage and how do you store them? I let them "cure" in a shady dry location (my back porch) for a couple of weeks, then box them up and bring them indoors. They'll keep for a few months. We eat the little ones first since they dry out faster. When do you wash them? Just before preparing to cook them? You got it. Though some folks wash them right after pulling, then let them dry and heal up for a while. check out "japanese" sweet potatoes. same genus and species, same method of culture, but they are red or purple/red skinned with white flesh. not nearly as sweet as common southern sweet potatoes (beauregard, georgia jet, jewell). instead they are white to creamy yellow, sarchy, flaky, with a taste reminiscent of chestnuts. you can get them at whole foods, or oriental grocery stores. they're popular with indians (from india) who think of them as "indian" sweet potatoes. i like raising them in tire towers. I am interested in finding the Puerto Rico sweet potatoes, they are plants , not vines. Any ideas on where to find them? I haven’t seen them before. I would check ebay and perhaps call some rare plant places and ask around. Hi David. 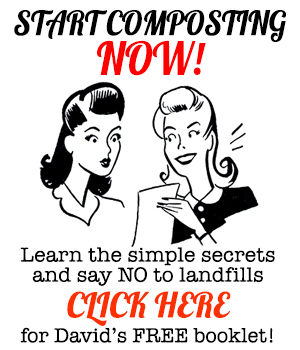 We just moved here from WV and are enjoying your site filled with tips for Florida gardening. And your books. I don’t garden but Bill, like you, started young. We’re on 4 acres in fort McCoy. Four tree covered acres, mostly mature live oaks. In just two months Bill has put in a drip system and planted sweet potatoes, white potatoes, blueberries, satsumas, guavas, a couple of peaches and lemons he started from seed and had in pots, mulberry, squash, bananas, Ginger, figs, olives, and I forget what else. Thanks to your post and your link we just got three soap berry trees from chiappinis. Bill, who is about to turn 80, isn’t much of a reader, thanks to dyslexia, but learns by seeing it done. 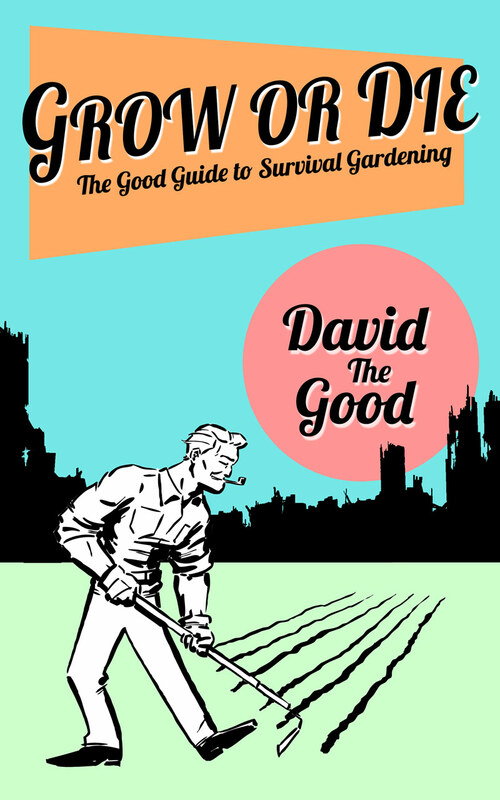 He’s always been a row gardener. It took me three years to convince him to mulch. Finally found a Ruth Stout video and showed it to him Now he’s a huge advocate. I read him your paragraph describing just one quarter of your forest garden and he said, I’d really like to see that. Is that at all possible? We’d be happy just to drive by and not take up your time. I know it’s asking a lot. You have our email if you care to respond.